YANGON—On a hot summer morning at a riverside plot in Yangon’s North Dagon, a small team of brewers carry sacks of grain imported from Germany on their shoulders to a small mill. There’s a brewer using a wooden paddle to stir the grain in the mashing tank. It’s steamy and smelly and there are pressure and temperature gauges everywhere. 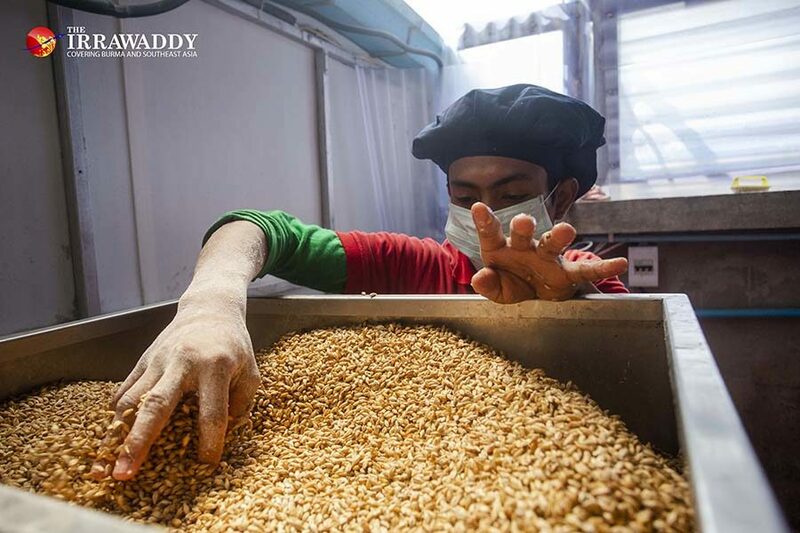 The hot, gloopy mixture will go through sparging, boiling and fermentation, and malt, yeast and hops will be added in the perfect ratios to create the most deliciously smooth and refreshing craft beer in Myanmar. This is Burbrit Craft Brewery, which was set up by a small group of enthusiasts in 2016, making history in Myanmar and delighting craft beer-lovers around Yangon. Initially, it took time to convince the local drinking community to pay up to five times more for a fresh, premium beer and outlets in the city and beyond were challenged by the necessity to keep it chilled at all times. 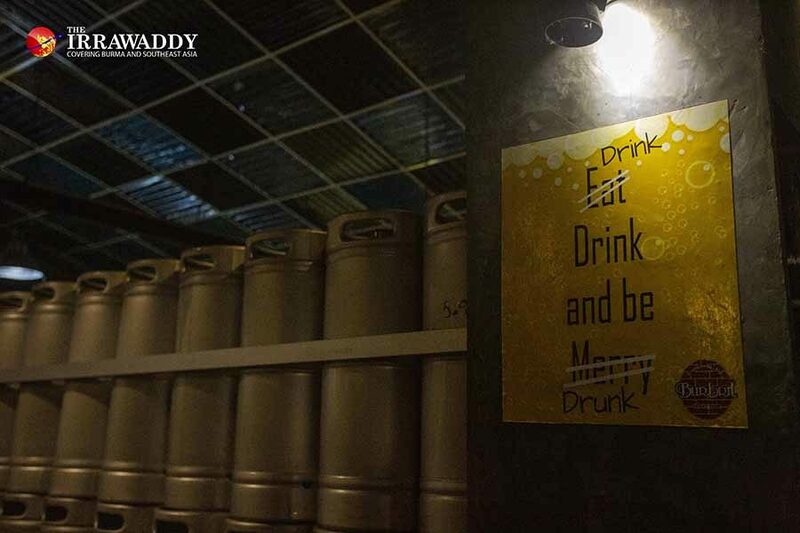 But the brewery has defied the odds and gone from strength to strength, opening a flagship taproom close to downtown Yangon in 2017 and producing canned beer to supply 45 outlets right across the country this year. Last week, The Irrawaddy interviewed three key team members behind Burbrit craft beer — general manager and co-founder Maung Zaw, factory manager Aung Kyaw Myo and marketing manager Zaw Min Aung — to find out what it takes to be successful in a nascent drinks industry and the exciting plans to produce a new line of beers. Who started Burbrit and why? 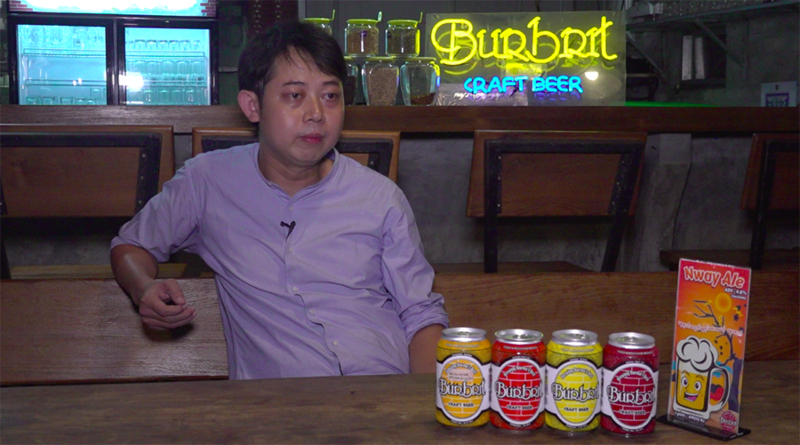 Maung Zaw: We have four founders—Htin Lin, myself, Guy Heathers and Win Kyaw—and the story started like this: Htin and Guy were working for the same company in Singapore and every Friday, Saturday they went to a brewpub named Brewerkz on the riverside drinking craft beer. They frequented the brewpub so much they would joke with each other about one day opening their own microbrewery. At that time, it was just a joke—not very serious. In 2013, myself and Htin came back to Myanmar and we got very serious about setting up a microbrewery and the others started pushing for us to buy a brewing license. In 2014 we applied for the brewing license but it was very difficult because at the time it was government policy not to issue any more brewing licenses. We submitted the application without much expectation. In 2015, they replied that our application was rejected. But we didn’t want to give up so easily. We changed the application to include that this brewing business would create a lot of jobs and would attract more tourists and we applied again. In 2016 we got the license. How has the company developed since then? MZ: Actually, when we started our brewery, our brewing capacity was only 3,000 liters per month. We started with only three flavors. Three or four months later we added three more beer flavors. Now, we are brewing 10 regular beers and two or three seasonal beer flavors. The point is our product line is getting bigger and bigger. That was the first major change. After that we managed to open the flagship taproom [Burbrit Taproom], because at the time a lot of people complained that North Dagon is very far and it’s not convenient to come here and have a drink, so we opened the taproom in downtown to make it more accessible for people to come and drink craft beer. Another reason for opening the Taproom is branding, for marketing purposes actually. We wanted to have more visibility. Recently we started to produce cans, which is very exciting. We expect to shift our cans to many different parts of Myanmar. Yes, producing Burbrit craft beer in cans has become a game-changer for the customers. How does it change things for the company? MZ: We are now distributing [canned craft beer] to supermarkets like City Mart, Capital and Orange. And regarding the price, while a bottle of [our] beer was sold for around 6,000 kyats (US$4) in the past, beer drinkers can now buy a can [of it] for 2,500 kyats. Now we can also distribute to places further away. Through there was demand for our beer in Mandalay and Naypyitaw before now, we could not distribute it there. But with the production of beer cans, we can now supply it to many towns including Myeik, Nyaungshwe, Inle and up to Loikaw in Kayah State as well as Mandalay and Naypyitaw. How does Burbrit defend itself against the dominant beer brands already in the industry? MZ: Myanmar Beer, Tuborg, Carlsberg and Heineken are targeted at those who want to drink a lot at a cheap price. Our craft beer is an upmarket one. We can’t compete with them because the product is of a different nature. We don’t have intentions to mass-produce. We don’t have a strategy to defend [against their competition]. We will proceed according to our marketing strategy and business plan. We don’t intend to compete with them. What are your ambitions in terms of the international market? MZ: At this moment, our main focus is in Yangon, so we are doing a lot of marketing so people know our product and start noticing our beers, but we are also trying to find ways to export our beer to neighboring countries. Htin, my business partner, is working on it and we plan to ship our beer cans to Singapore and Thailand. That’s what we are focusing on. We plan to export our beer to India, China and Japan as well. I think it will happen very soon. So yeah, we are trying to get our cans exported to the international market. What’s the fastest-selling Burbrit beer and why do you think it’s so popular? MZ: German Weissen was our fastest-selling beer for the last two years. We introduced Nevada Pale Ale about four months ago and amazingly it has already overtaken all other beer flavors. There is for a few reasons—compared to other beer flavors, the American hops that we use make a hoppy flavor shine through. It is a very outstanding beer. Another reason is the maltiness. Myanmar people are rice-eating people and they like a malty kind of beer flavor. That hoppiness and maltiness, the balance makes it different to the other beers. What is the Burma Brewers Club? Zaw Min Aung: The purpose of establishing the Burma Brewers Club is to give the knowledge of brewing in Myanmar, to develop brewing in Myanmar. We are the first to have a craft brewery in Myanmar so we need to educate people because otherwise they won’t know what craft beer is or what it tastes like. That’s why we have the Burma Brewers Club. We do demonstrations and give them samples of the special brews, the ones we are not currently selling, other kinds of beer flavors. The idea is that we want to introduce them to many kinds of [beer] flavors and to develop home brewing in Myanmar. Another thing is that we want to give them the message that beer-making is not so difficult. How does Burbrit craft beer compare to other beers? Aung Kyaw Myo: Normally, most of the industrial beer brands in the market are different from our product in terms of color and taste. Most of the industrial beers are clear [in color], and have a lot of CO2. Their strength is that they have a long shelf life. We don’t put much CO2 in our craft beer. We don’t filter them, so our beer is heavier than industrial beer and has a full flavor. 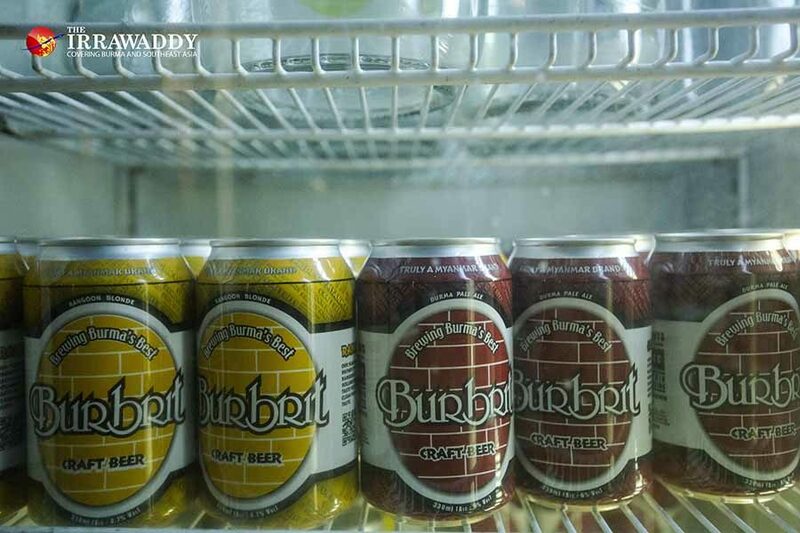 What can craft beer-lovers expect from Burbrit in the future? MZ: We have plans to produce beer under a different brand name. We are experimenting with beer that can [stay fresh] in air-con temperatures. Our research and development team is working on that at the moment. So hopefully, in four or five months, we will have two beers that will be stable under air-con temperatures. When this new beer is out, hopefully we’ll be able to distribute it to convenience stores in Yangon and further places like Myitkyina, Mandalay, wherever—you name it. At this moment we are selling fresh beer, which must be chilled all the time. The new beer will be more convenient for wholesalers, supermarkets, convenience stores. That’s our next major project we’re working on.